Hello, Friends! Today we are sharing two more cards using inlay die cutting technique with a tip on how to add dimension to sentiment die cutting. This is a simple, fun technique that adds some interest and dimension to your cards. 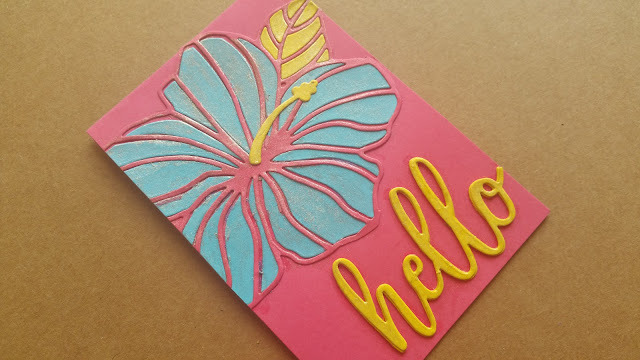 You can achieve this technique with almost any sentiment dies or stamps and it gives a unique look to your project. It's always a great idea to keep a bunch of these cards ready on hand to give away for any occasion. After all giving gorgeous handcrafted cards with unique, heartfelt messages shows your loved ones how much you care! 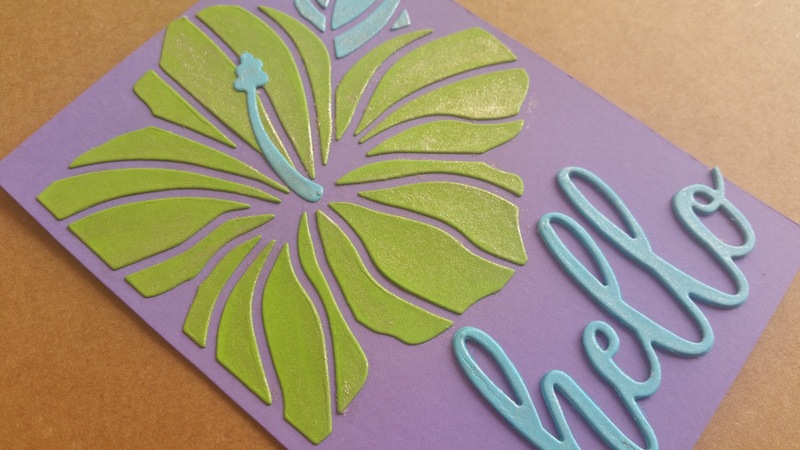 We started off this project by cutting different shades of cardstock with Hibiscus Frame die. Then we removed the die cut pieces and placed the frame on the card base only for reference. For the above card we simply glued the die cut pieces into the negative space and removed the frame before securing them on the card. For the card shown below, we first glued the frame to the card base and then adhered all the loose pieces into the negative space. Then for each card, we cut the cardstock 3 times with "Hello" sentiment die and stacked the die-cuts together to give a dimensional look. Finally, to add a bit of sparkle to the project, we brushed the die cuts with our Wink of Stella Clear Glitter Marker. 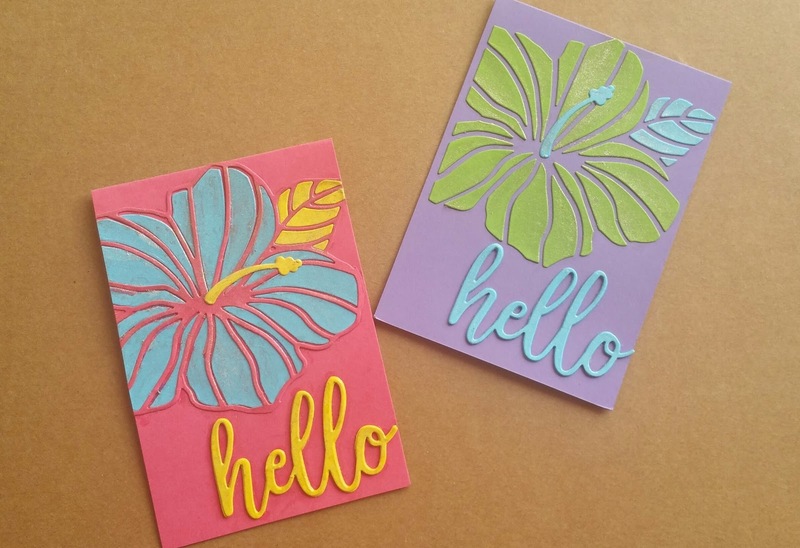 To create these cards on your own simply purchase the DIY kit and follow the step by step instructions to put your project together. If you are looking for a creative activity for your next party, these DIY kits will surely keep your guest busy. 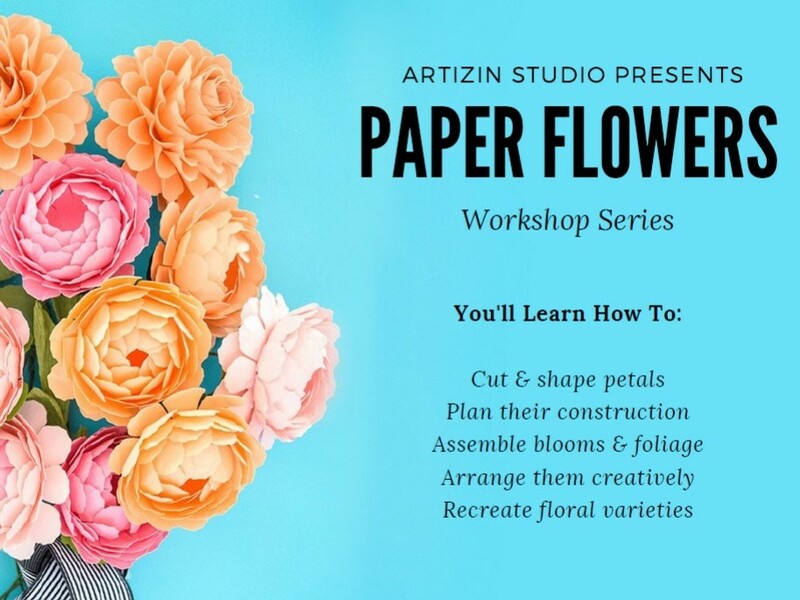 You can also walk-into our studio by yourself or with your group to make these cards, explore the tools and learn the technique! As usual, we have tons of DIY projects to share with you... and this is yet another one of them! We're always exploring new art forms, experimenting with latest tools and enjoying the process of creating and teaching! Sign up to get your weekly dose of creativity in your inbox! Original designs, photos and text are Copyright © Artiz.in 2018. All Rights Reserved.